All encouragement & necessary support is provided to our research team. 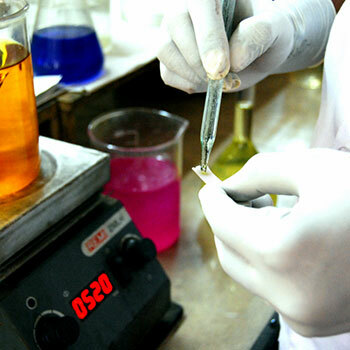 Our laboratory is equipped with all necessary infrastructures such as heating mantle, oil bath, lab stirrer and pilot plant with condenser and other attachments. Every attempt is made to continuously update our instrumentation capabilities. Our staff is trained to be in line with international requirements of quality control and assurance. We, at Gopinath Chem – Tech Ltd are committed to achieve customer satisfaction and conÿdence in our products and organization by . We are also committed to comply with requirements of QUALITY MANAGEMENT SYSTEM and continually improve the effectiveness of our Quality Management system for the benefit of our customers.